our terms and conditions, but industrially and politically. implications for rail freight as we await decisions on future contracts. we have to campaign against it in the Lords. and safety, not reduce dwell times and put greater strain on the driver. 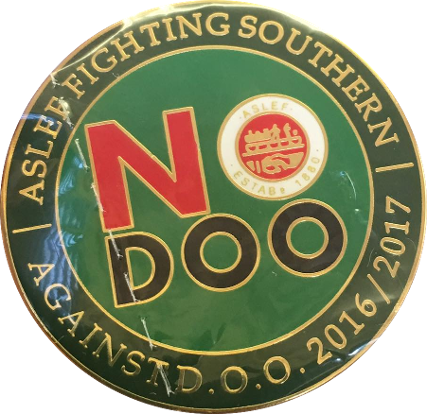 We shall not be supporting D.O.O. where the E.C. better to have a guard on every train and every platform properly manned. lost, better or more sensitive technology, not poor guidance, has to be the solution! we know that this year, like every year, we will have to fight for everything we want, and fight to keep what we have. Unions say no go D.O.O. I.E.P. trains and the government’s proposals for D.C.O. for the next Northern Rail franchise. should retain responsibility for door operation. where even more pressure has been placed on drivers, rather than questioning the safety of D.O.O. provide general reassurance and assistance to passengers. emergency services, and accompany a doctor who was travelling on the train to provide emergency first aid. opportunity to stay on the railway. and communications structure, of the railway. None of this makes economic or operational sense. that need more – albeit smaller – geographical monopolies? should be the basis of all our future pay claims? We could call it the Wilkinson formula! people publicly to damage their terms and conditions and futures. I wonder, is it our turn again? determined not to let you down. Deepest thanks, as I see this as recognition of the work all of us in A.S.L.E.F. do together. trade unions over his plans to force through changes to rosters. The comments were so bizarre that Sameena Rizwi of the DfT had to deny her boss had been drinking before speaking. of the civil service; and £125,000 more than the Prime Minister. market, destroying competition, and then ramping up the price of essential materials in the future. answered. They obviously do not know you, or what you expect from your union. year, exacerbated by academy dogma, and vocation is a dirty word in 2016. Doreen, his family and friends. He was, and will be remembered as, one of the best. Standing shoulder to shoulder on D.O.O. calling for a letter of solidarity to be sent to the R.M.T. in their battle over guards’ jobs with G.T.R. G.S. Mick Whelan said: ‘G.T.R. sent a letter to conductors saying, “We are going to take your jobs away and you may – may! when will they ever tell the truth? Southern’s ‘hapless’ management and the company’s ‘unacceptable’ performance. have called on the DfT to strip GTR of its franchise before it expires in 2021. Willingdon, called on GTR to halt planned changes changes to staff in a bid to spare rail passengers more misery. answer to a customer’s query. R.M.T. have been saying. They subsequently deleted the tweet, leading passengers to complain about censorship. and the hashtag ‘Where’s Claire?’ because the then Rail Minister went missing in action. absence of a legitimate trade dispute; inducing drivers to take action before balloting; and incorrect members being balloted. 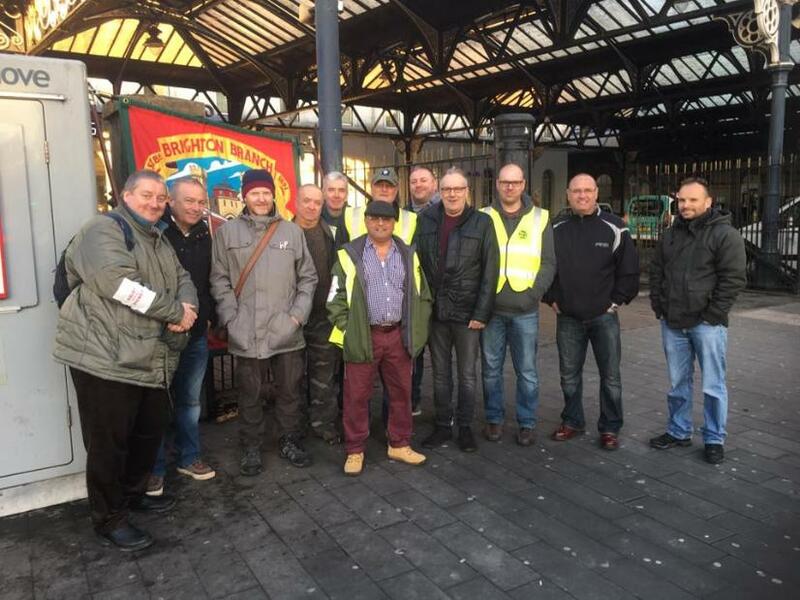 In the case of the second injunction, costs of £250,000 for the employer were awarded against ASLEF. with London Midland and London Underground. being called off or ballots stood down. (overground and underground) sector. 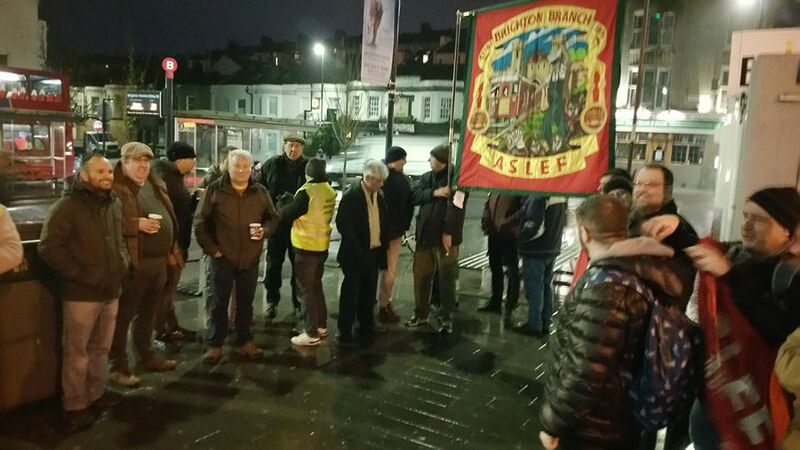 ASLEF and its sister union, the RMT, have been the targets of these injunctions. and ScotRail is a case in point – although here ScotRail is using other means to try to undermine strike action by the RMT. has the capacity to halt or seriously disrupt their operations and, thus, their revenue and their profits. goods or services are perishable; and supplies of strike breakers do not exist. equate to being above the threshold of 40% of all those entitled to vote voting for action. interpretation of them may even tighten as judges establish new precedents. the re-election of a Labour government with a policy to do so. This means, of course, a Labour Party led by Jeremy Corbyn. being done away with altogether. delays, cancellations and reduced timetable – his company provides. Paul Maynard, the new Rail Minister, has said the current level of service the TOC is offering is unacceptable. A disgruntled passenger hacked into a public display board at Blackfriars station to vent his (or her) anger in novel fashion. problems with freight, and how the DfT has come up short. have proper, decent jobs yet this government is trying to destroy them. The DfT is funding this, and the DfT is taking us on. Conservative government for its failure to help ease – and, over coal, to directly cause – the problems in the freight sector. is vital to a balanced freight sector and essential to the maintenance, health and safety of the entire rail network. failed to resolve the problems at the heart of this dispute. negotiation, not by legal action. from trains despite the fears of passengers. The unions believe the company wants to put private profit before passenger safety. complex ticketing and a lack of access for disabled passengers. not in the manner management hoped. between civil servants and a private company. govia’s executives still benefit financially as the DfT has authorised Govia to charge an ‘administration fee’. scandal – if the DfT were prepared to help Govia’s executives make money secretly here – what else was going on? Thameslink – but Rutnam is determined to protect Govia, and Brown and Horton, at all costs. relationship between GTR and the DfT, which extends to the very top. learn, has also been at the DfT – and is a former colleague of Philip Rutnam. no facts. my complaints were not dealt with, just denied. of our railway is being trashed. between Govia and the DfT. what point the D.F.T. will consider these risks sufficiently serious to warrant termination of the franchise. announcements, and a child abandoned on a platform due to overcrowding. ‘The D.F.T. has failed to enforce the G.T.R. franchise agreement and is evading responsibility to provide proper transparency. why the union is balloting members on southern for industrial action, and why D.O.O. is inherently unsafe. Commons Transport select committee in the Grimond room at Portcullis House on 24 October. situation don’t have the power to resolve it. we have agreements we seek to change them because we think they’re inherently unsafe. And the industry is now catching up. Today I was proud to stand on the first A.S.L.E.F. 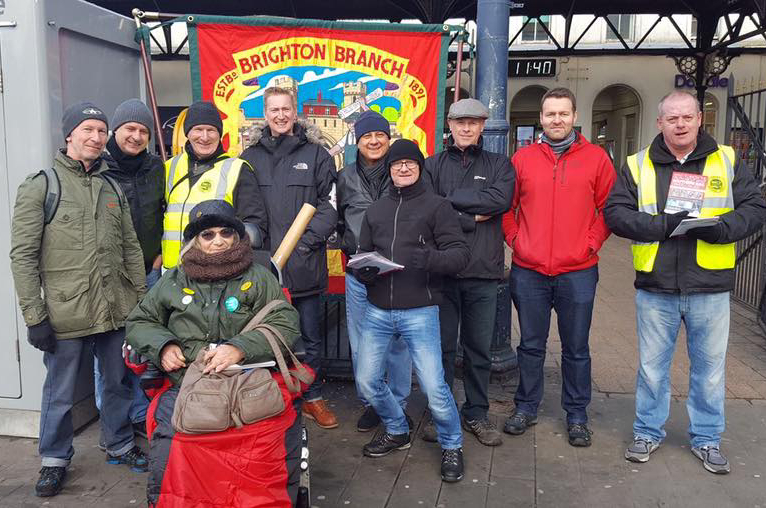 picket line to be seen at Brighton for nearly 17 years. some people would have to travel, this was in my opinion a good turnout. photos will serve to allay there fears concerning striking and encourage them to join their friends on the line. The support of our Guard colleagues with us on the line was a great encouragement. and are not even both affiliated to the same political party and, of course, compete with them in several areas. receiving far more messages of support and 73% of the public want a guard on every train. This is not about DOO, but dwell times, and is a scenario likely to be repeated in other franchises in coming years. Despite our challenges, may I take this opportunity to wish you a Happy and Peaceful New Year. have not been doing overtime since Tuesday 6 December. Justice Lloyd Jones, backed our right to take lawful industrial action. a.m. slot on Today on Radio 4; by Jo Coburn on Daily Politics on B.B.C. 2; by ITV News, Sky News and Channel 5 News. and E.C. No.1 Marz Colombini did B.B.C. London and a phone-in on 5 Live, too. the paper in a clumsy but co-ordinated campaign to push DOO. palpably unfit for the number of passengers we have in the 21st century. in zero hours contracts, in order to drive up profits for the privatised train operating companies that he represents. investment. This, of course, after we have undertaken the union’s primary role over terms and conditions, wages and safety. Even odder, given the many messages of support we have received, is the media frenzy over the dispute on GTR/Southern. is political – the last refuge of the inept – while a baying media calls us anti-worker. the solidarity and unity you show inspires me. empty coaches parked up at stations. Guardian for an apparent conflict of interest. Southern, Thameslink and Great Northern franchises on a plate to GTR in 2014.
which, The Guardian revealed, had also paid handsomely for the services of First Class Partnerships. According to The Guardian, an internal inquiry by D.f.T. officials concluded that Wilkinson had a ‘clear conflict of interest’. A.S.L.E.F., and this dispute, has had. The Sun, Daily Mail and Daily Telegraph were, predictably, the worst. and NI contributions despite being provided with the correct figure. D.O.O., ‘A.S.L.E.F.’s response was rather more slick’. above quotes from Tom Tugendhat, Tory MP for Tonbridge & Malling. imagining Jeremy, Tosh and Santa at Christmas. interlocking system doesn’t always work. – in The Guardian (7th January). Today; by Eddie Mair on P.M. on Radio 4; by Nick Ferrari on L.B.C. ; and on Daily Politics on B.B.C.2. South-East, while E.C. No.1 Marz Colombini talked to B.B.C. London and went live, at length, on 5 Live. continued to maintain the fiction that an opportunity to sit in the audience was ‘an invitation to participate in our debate’. Reith and sell the licence payers short. A.S.L.E.F. 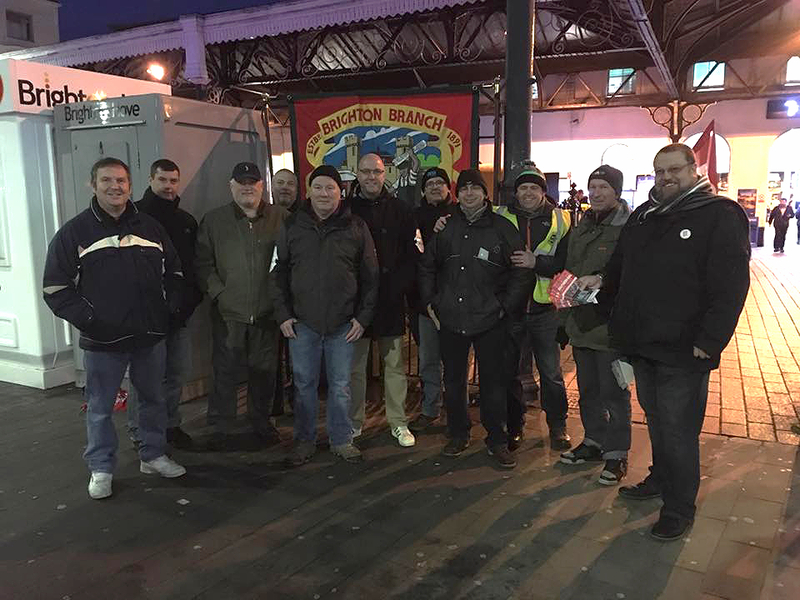 drivers on Southern Railways began taking industrial action in December. But the antecedents of this strike go back almost a year. Last month as at the end of last year, Southern Railways ground to a halt. That is what happens when train drivers walk out. refuses to employ the number of drivers it knows it needs, it has been cancelling one in four services on non-strike days, too. majority of passengers – 73% in a survey carried out by Opinium in May last year – want a guard on every train. Rizwi was forced to deny claims that her boss was drunk when he got up to speak. he, the DfT, and GTR intended to do. We wrote to Patrick McLoughlin seeking clarification of Wilkinson’s comments and asked if they reflected government policy. was speaking for the government. Northern it is the largest rail franchise in the UK. want your support’ – because the company would not suffer a loss of revenue through industrial action. company sought to negotiate its implementation with us. campaign in a ballot for industrial action. overwhelmingly – 87.3% on a turnout of 77% – to strike, with 95.6% voting for action short of a strike. Britain’ then took us to court. But the High Court, and then the Court of Appeal, both ruled that our strike is entirely lawful. related issues on G.T.R. Southern services? to be counted: 691. Turnout: 72.7%. returned by 10 a.m. on Thursday 16th – and the union went back into talks with the company on Tuesday 21st February. the company. The following question was put to members. Ballot papers were sent out on Thursday 16th March to be returned by Monday 3rd April. A.S.L.E.F. 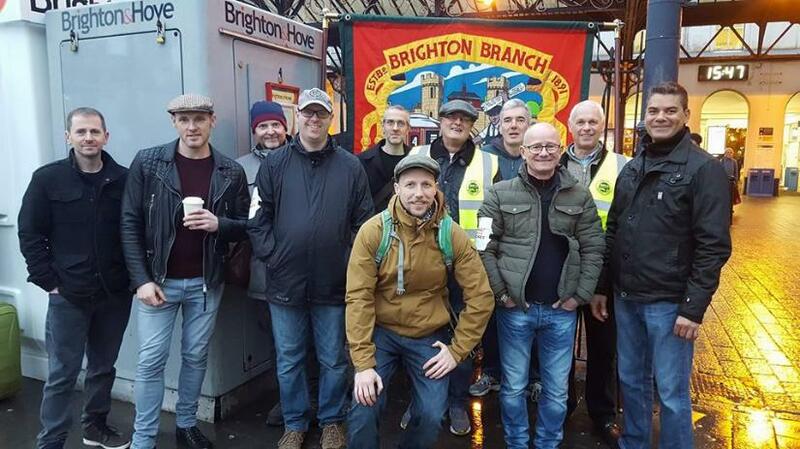 drivers have rejected a proposed resolution to the long-running dispute with Southern Rail. driver only operation and related issues on G.T.R. Southern services? The result was Yes: 346 (48.2%). No: 372 (51.8%). over from a debate on climate change and had to rush back for the afternoon session; but his visit was much appreciated. Andy said he had mostly been occupied by the issue of DOO and realises how important the dispute on Southern has become. view, but also by keeping the public safe from anti-social behaviour, and helping those with disabilities. listening to and working with the rail unions. E.C.No.1 Marz Colombini brought delegates up to date on our long-running dispute with Southern Railways. concert with the travelling public. put it all behind them until the next time. And so on, and so on. 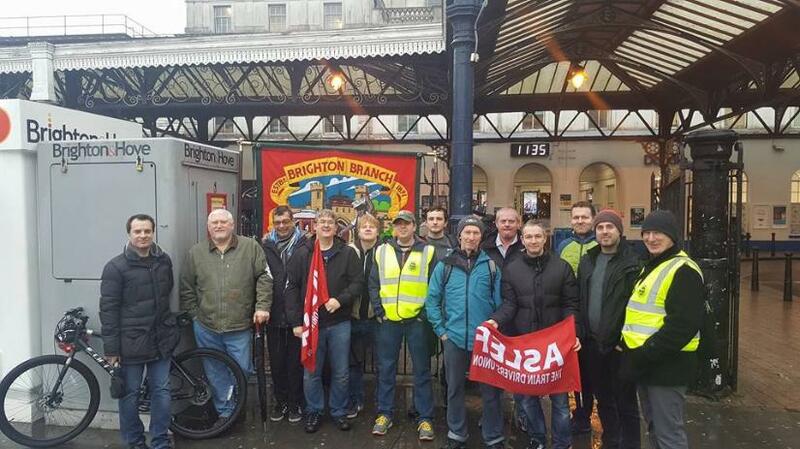 organise protests, initially at Brighton and London Victoria stations. on key organisations in the rail industry. demands and requesting their full response – so we can tell you which candidates have the best positions on Southern Rail’. concludes that this is manna from heaven for the rail unions, a few issues must be pondered. of the country in order to make the ABC a genuinely national organisation. One hopes not. franchise is sorted out. Once the anger is gone, the momentum and mobilisation will go too. obviously, over industrial action in support of a pay claim. given the Labour advance – and Tory meltdown – on 8 June! relations and deliver the service that passengers in the region deserve. issues of driver-only operation, terms and conditions of employment, and pay. 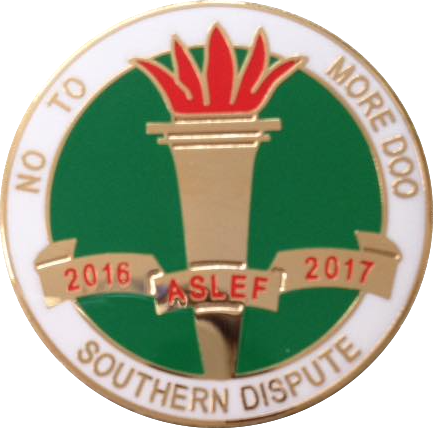 Aslef has ensured that no additional trains on Southern will be rostered without a second safety-trained member of staff. exceptional circumstances when all other options have been fully exhausted. In all these circumstances, arrangements must be made to restore an OBS to the service at the earliest opportunity. 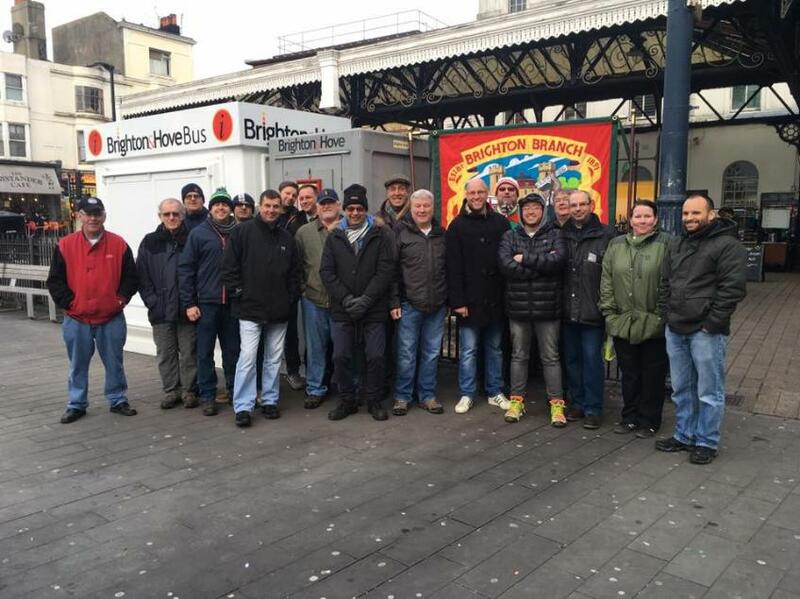 Aslef has ensured that all second safety-trained staff across the franchise are permanently and directly employed. 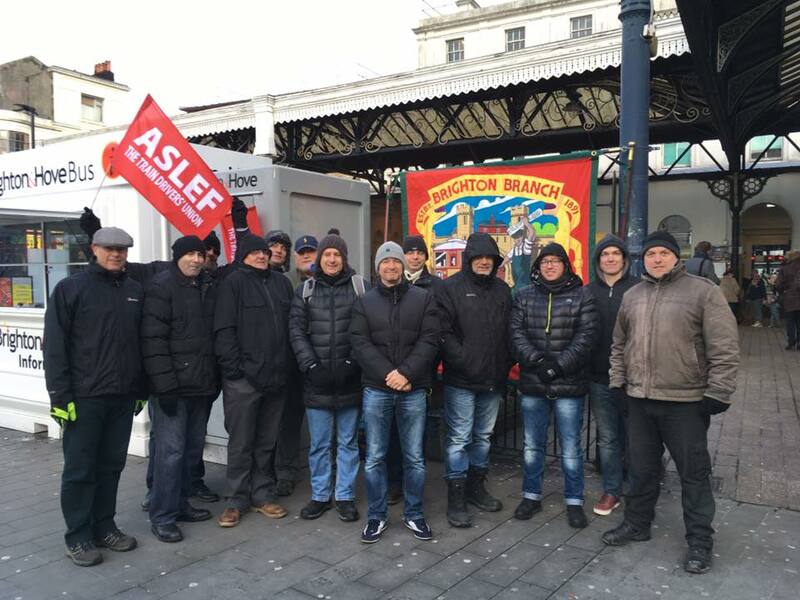 Aslef has ensured that more second safety-trained staff will be recruited. So jobs have been created. Not lost. The resolution accepted by our drivers on Southern Rail applies only to that company and that franchise. each company and that is what we have done here. resolution to a dispute, not a template for Britain’s railway in the 21st century. and a member of Labour’s national executive committee. April last year (2016), dealt with three different issues – driver only operation, terms and conditions, and pay. ‘The agreement also confirms the terms and conditions under which our members at southern are employed. basis with each company and that is what we have done here. this region, for the passengers who use Southern Trains, and for the businesses which depend on the service. people can get off the train and use the toilets at stations. But most stations have locked their toilets because of vandalism. service is to remove staff from lots of stations. ASLEF’s position on driver only operation. decent terms and conditions for our members. dignified silence. Our enemy is the DfT, and GTR, our enemy is not another union.